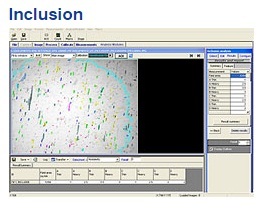 The Metallurgical Image Analysis Software which enables you to analyze images captured from microscopes to obtain specific measurements that include caliper measurements such as length, areas and distances and counting and classifying objects, particle sizing, particle spacing. Advanced measurement modules include Grain size, Phase / Volume fraction, Inclusion analysis, Nodularity measurements, Graphite Flake measurements, Porosity, Carbide Banding and Dendritic Arm Spacing. We are authorized Distributor for Metallurgical Image Analysis Software located in Kolkata, West Bengal, India. For various Metallurgical Analysis such as ASTM Grain Size, Nodularity, Phase Analysis Inclusion Analysis, Porosity, etc. Authorized Distributor for Metallurgical Image Analysis Software, located at Kolkata, West Bengal, India.